Since many laptops and Ultrabooks are not equipped with a Gigabit Ethernet port, the USB3GIG is a valuable add-on, delivering high-speed data transfers via USB 3.0. Featuring a Gigabit Ethernet port on one end and a USB 3.0 connector, now you can quickly download large files, stream movies, and get work done. Plug the USB3GIG's USB 3.0 connector into your laptop and connect Gigabit Ethernet port to an Ethernet cable and router. The adapter's flexible cord makes it easy to connect, even in tight spaces. By adding an Ethernet port to your ultra-slim laptop, notebook, or tablet, the USB Ethernet adapter Gigabit USB 3.0 provides an alternative to connecting to the Internet via Wi-Fi, which can be spotty and unreliable depending on your location. The adapter is the perfect solution for the business traveler who prefers a secure and fast wired Ethernet connection. Ideal for travel, the USB3GIG features a slim, flexible design that fits easily in a pocket or laptop case. A travel cap keeps it protected when not in use. Learn how the USB3GIG adds Gigabit Ethernet connection to your Macbook Air, Chromebook, or Ultrabook. Enhance the power of your Netbook or Mac with wired Gigabit and USB 3.0 connections. Compact and convenient for travel. A reliable hard-wired USB 3.0 port to Gigabit Ethernet connection provides super speed, wherever wireless is unreliable or inconsistent. 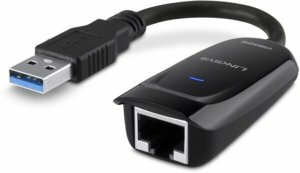 Connects to any Ethernet-enabled device with a network port. Flexible and compact, ideal for travel.